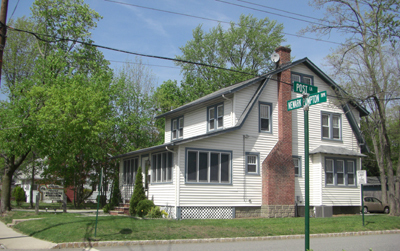 We are conveniently located on the corner of Newark Pompton Turnpike and Post Lane. The Riverdale School is across the street on the opposite corner. Newark Pompton Turnpike runs between Hamburg Turnpike and Route 23. From Route 287, take exit 53, make a right onto Hamburg Tpke. Make a right turn at the traffic light onto Newark Pompton Turnpike. (Sunoco Gas Station on corner.) We will be on your left hand side (3 blocks down). Our driveway entrance is before our sign (or else turn onto Post Lane and there is an entrance behind the building). If you pass the Riverdale School on your right hand side, you went too far!! From Route 23 North, take the Newark Pompton Tpke exit for Riverdale (This is the exit just past Circle 3 Farms and Curly’s Ice Cream). Go past the Riverdale Public Library and Municipal Building. When you see the Riverdale School on your left hand side, we will be just past it on the right hand side. Stewart Family Chiropractic serves patients from all over New Jersey. Folks from Riverdale, Pompton Lakes, Pompton Plains, Pequannock Township, Bloomingdale, West Milford, Wayne, Butler, Wanaque, Haskell, Kinnelon, Ringwood, Oakland, Wyckoff, Franklin Lakes, Montville, Boonton, Lincoln Park, Fairfield, Totowa, Woodland Park, Haledon, North Haledon, Hawthorne, Passaic, Paterson, Oak Ridge, Little Falls, Cedar Grove, Newton, Morris Plains, Nutley, Belleville, Garfield, East Hanover, Highland Lakes, Hillside, Towaco, Hewitt, Vernon, Hamburg, Andover, Parsippany, Caldwell, and Mahwah, Newfoundland, Sussex ,Hoboken, and Suffern and Warwick, NY all call Dr. Gary Stewart their chiropractor and find that it is well worth the trip!